FYI: Please note that for us, the most important part of an adoption is finding the right dog for the right person but we very much hope that people consider first, either our oldies or those who would be put down on other farms for medical reasons. These dogs would make strong companion pets and would, I believe, have a better life if they could retire to a sofa. All of the dogs that we consider to be suitable for adoption have spent time indoors and are either completely or nearly 100% house trained. All are open and friendly towards people, although those in the 'special needs' section need experienced owners for various reasons. Click on the name of the dog you are interested in, to find out more detailed information about them. The dogs are listed in priority adoption order within each category. Please send all adoption enquiries to hettahuskiessponsorship@gmail.com. It is pretty easy for anyone living in Scandinavia to adopt one of our dogs and if you are looking for a certain type of dog (one that can run with you or one that is good with kids, etc), please do get in touch. We have some dogs here which we have rescued from other farms in the recession to save them from being put down, and we have other older dogs that could be retired but are just not in as much need as those shown here. Hence, do get in touch with your wish list and we will see if we have a dog that is suitable for you. 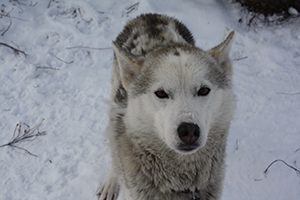 We would rather that they go to the ideal home than that they stay running, here, if they are not that great as working sled dogs or if they are already on a reduced running plan from old age. For those living overseas, it can be quite complicated, expensive and time-consuming to sort out the inoculations and paperwork needed to get the dog ready to travel. However, it is not totally impossible and, as you can ready on the lucky dogs page, we have dogs who have moved as far away as Colorado and New York as well as quite a few who have travelled to the UK or Central Europe. 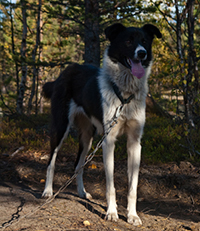 More information about how to travel through Scandinavia into other European Countries overland or further afield, eg using a pet-transfer company, can be found here. Little Nana has the heart and sole of a champion but her body reacts badly if we accidentally make her run in too hot weather (anything over -12C!). Whilst one of our favourites, we would reluctantly give her a chance at a better, more balanced, life for her, should the right home arise. Nana has one of the best work ethics on the farm, to a fault. She tends to get too excited and pull so hard that she often overheats and has collapsed while running. Additionally she is on anti-acid pills most of the time. This little lady is sweet and always has the best intentions at heart but is somewhat clumsy with such a long body and short legs, often getting herself tangled in things and consequently injured. All she really wants are people that love her unconditionally and have some patience with her clumsy, affectionate, slightly ADHD nature. Ideal new home: A family that will love her, and can take her out often. If possible somewhere outdoors would pronanly also be good for her. How would she deal with being alone during a working day: Nana was speyed a few years ago and after the operation lost some control of her bladder. This is a pretty common side effect of being speyed and is easily and cheaply controllable with a pill. Another of our dogs who was adopted with this same issue actually became fine without taking the pill after a while of getting into a relaxed routine in her new household, so this might not be a forever need, but is one that any potential new owner would need to consider. To what extent can she still do canicross in summer / go skijoring with me in winter? She would definitely enjoy it but you need to be extremely careful with running her in warm temperatures and for too long a period of time. Neo is a big sweet boy who still loves to run but he has had a number of medical issues and we think it is time he started an easier life. The first medical issue that brought him to our attention when he lived on a different farm was a stroke. We took him in to give him a chance and after a couple of weeks of being lifted in and out of the house, he started to walk a little and his head gradually returned to a more normal position (it is still held slightly to one side if you look closely). He was effectively 'put out to pasture' to take as long as he needed to recover and he started again the following year. Unfortunately, just when we thought he was over the stroke (obviously running on a reduced running plan), he started to develop pancreatic issues. These can be controlled through a low-fat diet, but he is a huge boy and it makes it hard to keep the weight on him when he is running as much as he wants. Hence, we feel that he has given enough and would maintain his weight more easily in a home setting. How would he deal with being alone during a working day: . To what extent can he still do canicross in summer / go skijoring with me in winter? . Though one of our oldest, Hendrix is still among our strongest. In the 2016-17 season he ran day safari products with ease and had no injuries apart from mild limping. While Hendrix still has loads of energy and would need a lot of activity in his retirement home, he is getting old and deserves to be pampered by a someone who can care for his needs. He can be a little shy and reserved with people, but once you build a relationship with him, Hendrix is very sweet and playful. He enjoys nuzzling up to you and getting back scratches, especially in spring when molting his winter coat. He is always curious though cautious about anything unfamiliar. Ideal new home: Optimally somewhere he can live outside most of the time. Hendrix is house-trained as well but occasionally gets restless and might become destructive if bored. Sneakily good at opening doors. How would he deal with being alone during a working day: The main concern for Hendrix at this time is his energy level - you would need to test him for the first few weeks if planning to leave him alone inside a house. He would probably be best off living in an outdoor kennel and cage or space to roam. While living on a running circle chain he was known for chewing his kennel. While he is currently living in our retired running fence with three other oldies, and is usually very outgoing, he should live with easy dogs. To what extent can he still do canicross in summer / go skijoring with me in winter? 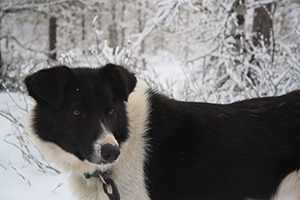 Hendrix is a reliable, steady skijoring partner and would absolutely love it. Since KGB's sister, Fala, has already been lucky enough to head off to a new home, we think that KGB would be more than happy to find a place on an equally soft sofa. 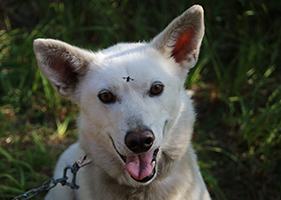 KGB is a special Taimyr dog from Siberia - an ancient breed and one of only a few in the world. She and her sister had hernias when they came to us which were successfully operated but we have always been a bit hesitant about using them in a full-on running program because we haven't wanted to put them under too much strain. 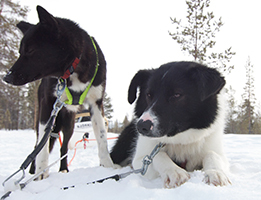 Additionally KGB is not the most motivated sleddog, unable to keep up with the others though she has the strength to stop a whole team to use the toilet! Poor KGB was offered a forever home in the UK by a caring family but the timing wasn't right for her since at the time, she was being fostered by a local family who had just lost a dog and needed a companion for their remaining dog. We hoped that she might find a forever spot there and so we steered the people offering to take her, rather, to another dog. Unfortunately the local family decided that they wanted their next dog to be a puppy instead, so hopefully this hasn't made KGB loose out on the chance for a forever home. She had totally become used to sofa life and will be a little sad to return to a cage on the farm for yet another winter. Ideal new home: A family that can give her lots of love. She is very sweet and has been off-lead around our farm without any problems, walks right next to you (or behind) and waits patiently for treats. How would she deal with being alone during a working day: KGB is a perfect couch potato inside the house, she spent a lot of time inside due to operations and learned the ways of a house pet. While she is large in size, KGB is house-trained and easy. She would probably be fine with other pets as well, though she can be grumpy with food. To what extent can she still do canicross in summer / go skijoring with me in winter? KGB is not very fast and does not pull but will happily follow beside or behind you. Soda is not an aggressive dog but he is huge and high-energy, often frightening other dogs. Similar to asthma in humans, he was born with a respiratory problem from the larynx causing wheezing during exercising or excitement (laryngeal paralysis probable). For this reason we do not run him further than 4km distances with the other huskies. With the right handler Soda would make a lovely companion: he is overly affectionate and wants nothing more than to please you, but does not understand his own size or strength. On the lead Soda has a tendency to lunge forward and run around in wide circles, though if you can get him to walk next to you he just looks up at you and does not pull (until he forgets and lunges forward again). As long as you can get him to understand what you want he is obedient, but his attention span appears similar to someone with ADHD. 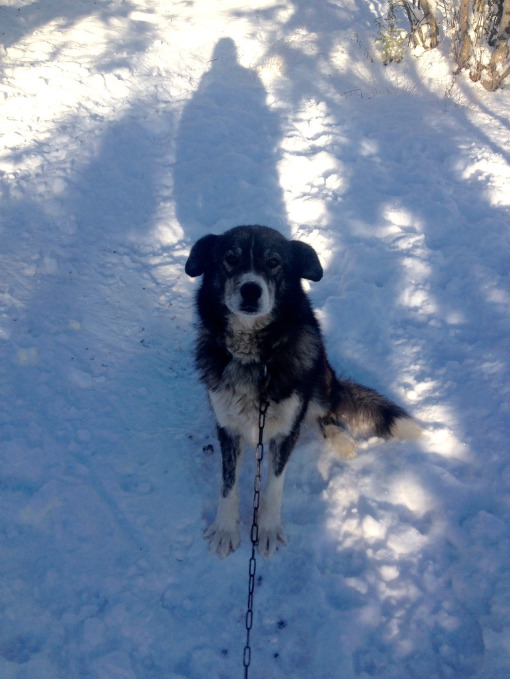 As he is still growing into adultood now would be a good time to find Soda a home where he would get the attention, training, and love that he needs. Ideal new home:With people that are able to handle such a huge, strong, and high-energy dog. 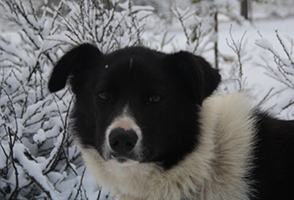 Most other dogs get frightened or defensive with him, has one dog on this farm he has lived with consistently without problems (Moscow). How would he deal with being alone during a working day: Soda is still quite young and has improved inside the house over his time here. He used to pee whenever he got too excited, now is more in control of his bladder and better house-trained but needs to be watched inside the house at the start, could easily break things. Has short fur so better inside if living in a cold environment (Eurohound heritage on father's side). To what extent can he still do canicross in summer / go skijoring with me in winter? Difficult to do anything other than hiking because of his strength and lunging in circles, but definitely needs exercise as long as he is given breaks to monitor his breathing. To what extent can he still do canicross in summer / go skijoring with me in winter? Ronnie is the son of a Pyrenean Mastif and an Alaskan Husky mother. As such, he combines the best of both worlds and is quite a big boy. He adores cuddles and isn't a great sleddog. In fact, he was rescued from Valimaa to save him being put down. 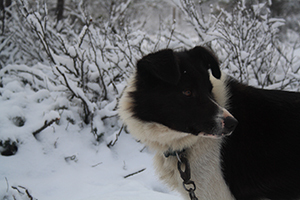 For a family, however, this relatively young dog would be totally great as a skijoring or hiking companion. Jani, like Merlin II, has not run the past few seasons because of a chronic limp. He is not able to run the same distances as the other working dogs without hurting himself, and would be better off finding a couch to live on. Spending most of his days inside now, Jani is a bit timid and slightly difficult compared to Merlin2 in his behaviour. He is mostly frightened of men and new people, hence better off with women and it will take time to grow a relationship with him. For this reason it would be nicer for him to be in a quiet, peaceful environment with just a few people. He is otherwise low-maintenance and really just looking for a place and family to call home. Jani is prone to limping since his wrists are not quite strong enough to support his gangly legs and frame. He would have a far better quality of life in a house with normal levels of exercise. For that reason, however, he wouldn't be a good candidates for a household looking for a husky to go running long distances with. Ideal new home: A quiet, peaceful home with a soft couch or dog bed one or two cuddly human being(s), without too much activity. Jani might be scared of children and other loud pets but is very sweet with puppies. How would he deal with being alone during a working day: He has spent a lot of time inside, should be fine once he is comfortable in the new environment. To what extent can he still do canicross in summer / go skijoring with me in winter? Would be better not to, his limping can get pretty bad (also not a young dog). If you do go very slow and easy. Minnie and Mighty (both sisters who came to us as rescue dogs at c. 8 months of age) do well on a reduced running plan and therefore would probably be fine, 90% of the time, running or walking to the same level, or more, than most households with dogs. However, they are both very shy little dogs that would need special handling. For that reason, I debated as to whether to put them, rather, into the 'special needs' category. These scared little muts were unbelievably good sleddogs in their day, whereas Patapov, for instance, was always pretty useless. There is a surprising amount of 'zest for life' behind their fearful demeanours. Minnie & Mighty come from a litter who are all fairly timid around people. Minnie is the bolder of the two, still requiring time and patience to get comfortable around you. However, she will eventually curl up in your bed and let you stroke her. Mighty is the smallest and shiest of their whole litter, and would rather find the furthest corner of a couch or room to sleep than near people. When touched she tends to freeze up and mostly wait for it to be over. However, the small improvements we have seen in her sisters mean that she has potential as well. All of the dogs from this litter are prone to limping and they would have a far better quality of life in a house with normal levels of exercise since the distances that the working dogs should ideally be comfortable running, are too much for these little girls. Ideal new home: Hopefully together so that they can gain confidence from each other (if able to adopt a third sister this would be even better for them). Somewhere calm with patient owners who are not expecting to see immediate results. How would they deal with being alone during a working day: Having spent some time inside, the girls know what the rules are for the most part but should not be trusted in the beginning. If too nervous or excited either one might still pee inside, and Mighty is known for swallowing objects. To what extent can they still do canicross in summer / go skijoring with me in winter? You would need to watch them carefully for limping. Not really the ideal dogs for this, would be better as house pets who get regular walks. Pekki secretly likes to be stroked. He is unsure and shy about it at first, but he enjoys it. He is a dog that will slow a sleigh team down. He seems to be keen on running, just not pulling. With care and attention, Pekki could make a great house dog. Though he may be a bit too shy to live with young children. Ideal new home: A calm house with or without dogs. How would he deal with being alone during a working day: At first, Pekki may not be able to stay alone all day, but if he started being alone for a short time and then had that time alone increased gradually, he could be happy. To what extent can he still do canicross in summer / go skijoring with me in winter? He can do these sports, though he may not pull so well .Which would make him good for a learner. Although Mullers is shy at first, he does warm up tothe guides here. We think he may be a "one person" dog. Once just one person is feeding and walking him, we feel he will become a very loyal dog to his new owner. He is not so good with other dogs, and we feel this comes from a lack of self confidence. This may well improve after some time with one owner and gaining more self assurance. Ideal new home: A calm house with no other dogs. To what extent can he still do canicross in summer / go skijoring with me in winter? He loves to run, but he can sore elbows or shoulders. So he can run and pull, just not too far and with careful monitering. Keri could only go to an experienced dog handler. His behaviour is unpredictable and has improved inconsistently during his time here. We believe that he would do great with an owner that can put the effort into their relationship, but this may require a lot of work. 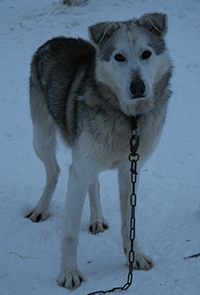 Keri is extremely intelligent and obedient (though grudgingly so), but behaves unpredictably in different environments. Generally he is timid with people, though he has a calculating and interested look in his eyes the whole time. If you do manage to catch him, and stroke him in a calm, confident manner he does eventually enjoy it. Often it helps if you have something to distract him as you approach him. Keri hates being surprised or touched lightly (have had to massage him for stiffness in joints), and has often nipped guides out of fear or surprise. In the line he gets overexcited and clips his teeth together while barking, often scaring the other dogs (and people). Currently living in a small running fence with an easy dog (Pegasos - could potentially also be persuaded for adoption), Keri appears happy and engaged, coming up to sniff your hand. In the right environment and with the right person we think Keri could make a lovely companion, but creating a real relationship with him requires a long time commitment. Ideal new home: Somewhere peaceful and quiet with calm and experienced dog people, would probably be better in a home without children or other pets (unless he gets along with the other dog, in which case it might be better for him). How would he deal with being alone during a working day: Would need to be watched closely in the beginning. Keri is old and not high-energy but still strong. He has not spent a lot of time inside the house, appeared frightened at first by all the new things but eventually settled down and came to enjoy receiving more attention. To what extent can he still do canicross in summer / go skijoring with me in winter? He would probably be quite good, still a strong boy but is getting quite stiff which needs to be watched out for. Save is like a misunderstood, slightly awkward friend who is sweet at heart but doesn't quite understand social cues. On his circle he will bark incessantly until you approach him, at which point he startles and backs away a little. Once he gets to know you Save loves cuddles and enjoys spending time among people. 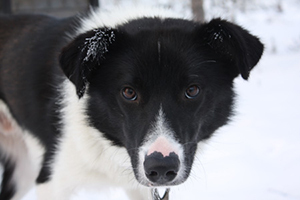 He has spent enough time in the house to know how to behave, and has reached a point in his life where he would be happy to retire from life as a sleddog. Ideal new home: Somewhere he gets lots of attention and a comfortable couch. Save is a fairly big dog but is not too active anymore, so would probably be fine with just a few walks a day. Though he is pretty easy Save should live with other easy dogs. How would he deal with being alone during a working day: He should be alright, but would have to be monitored at the start. Though he is very well house-trained, Save has not been left alone in a house before. To what extent can he still do canicross in summer / go skijoring with me in winter? Save could probably do it, though he isn't so active anymore. Timon nearly got an adoption opportunity last year but then, unfortunately, he developed a large swelling on his neck which needed weeks of investigation and he missed his chance. The swelling was either a form of hyperplasia or a lymphoma but it is currently not being treated (although a hypothyroid condition, which is fairly common in sleddogs, which was discovered at the same time, through blood work, is treated daily with low-cost pills). Timon was very shy when we arrived at the farm, but he has a strong natural play instinct which was only just hidden under the shy demeanour he had learned to show. For instance, right from the beginning he would bark and wag his tail at you to get your attention but then when you would go over to him, he would run away and when you had finally given up on him coming to you and started to leave his circle, he would run after you and maybe even nip your bottom to say 'come back...give me another chance!'. We put him on the front row of the farm for a while and he got a lot braver after a season of being approached by clients with treats so now he is at the stage at which he will come forward to sniff even a stranger's hand (in case they have treats) and he plays comfortably and lovingly with the guides. He is a large, fluffy and gorgeous dog but even though he is definitely at the easy end of our spectrum when it comes to interaction with other dogs, he doesn't necessariy like every male dog so we would need to check how he would be in a household with other dogs. Ideal new home: A house with calm people, so he does not get too excited. How would he deal with being alone during a working day: We believe Timon would be ok during the day, especially with a dog bed or sofa to relax on. To what extent can he still do canicross in summer / go skijoring with me in winter? Timon does enjoy working and would be enthusiatic to do these sports.